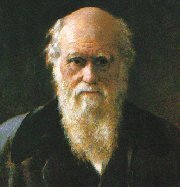 Charles Darwin is considered to be the father of the evolution theory. He was born in a well-to-do doctor's family in Shrewsbury in England. He didn't learn much at the schools he visited, but in his leisure time he learned the more. 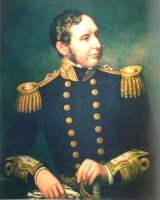 From 1832 till 1836 he made his famous voyage around the world with the research ship HMS Beagle, in which time he developed himself to a skilled naturalist. In 1838 he suddenly understood how evolution works, namely through natural selection, but he didn't dare to make his idea public, because he was fearing the consequences of it. Only in 1858, when Alfred Russell Wallace also discovered the concept of natural selection, he came out with his theory. In the meantime he had collected a huge number of arguments and these he used for the writing of his most famous book 'On the origin of species' (1859). The book caused much commotion, especially in clerical circles, but scientists fairly soon accepted the fact that new species could come into existence by 'transmutation'. After this, Darwin has written many other books on different subjects, which had in common that they concerned the miracles of evolution. In this slide lecture the story of Darwin's life is told. However, it cannot be complete, because it would become much too long. For those who like to know more about it, links to other websites are given, which can provide supplementary information. Furthermore the booklist offers enough possibilities for deepening the knowledge on Charles Darwin. In the 90ths my wife and I have made a trip through Great-Britain, where we visited the places where Darwin lived and worked. Many of the photos of this journey are used in this lecture. Evolution is the transition of a species to another species. The many species of plants and animals, which are now living on earth, have come into existence from other species in the past millions of years. Related species have a common ancestor. The African and the Indian elephant for example are probably descended from an elephant species living about five million years ago. Charles Darwin is considered to be the father of the evolution theory, althought Alfred Russel Wallace has found it too. Darwin exposed his theory extensively in his book 'On the origin of species' which came out in 1859. The theory of evolution is very important because it explains how nature on earth acquired its shape. One gets more respect for nature knowing how many millions of years it took before all those numerous species came into existence. Evolution is a very complicated process. In the lecture, the way in which it works is explained as simple as possible. If you want to know more about it, you may read one of the many books written on this subject.